Originally published in the Tulsa World. Written by JARREL WADE, World Staff Writer on Wednesday, July 27, 2016. Ken Busby, executive director of the Route 66 Alliance, talks with City Councilor Connie Dodson at the Crystal City shopping center during a tour of Route 66 through Tulsa on Tuesday. 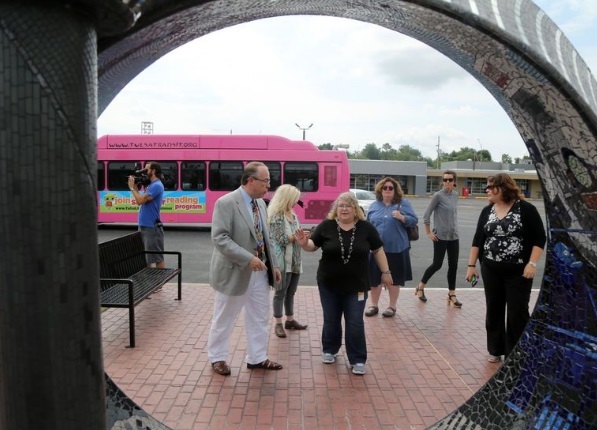 MATT BARNARD/Tulsa WorldCity councilors and other local leaders hopped on a bus Tuesday to see where the rubber meets the road along Route 66’s path through Tulsa. With some Vision Tulsa sales-tax money going to help commercial revitalization, including along the Mother Road, the officials wanted to see the entire 24-mile stretch of Route 66 through town. 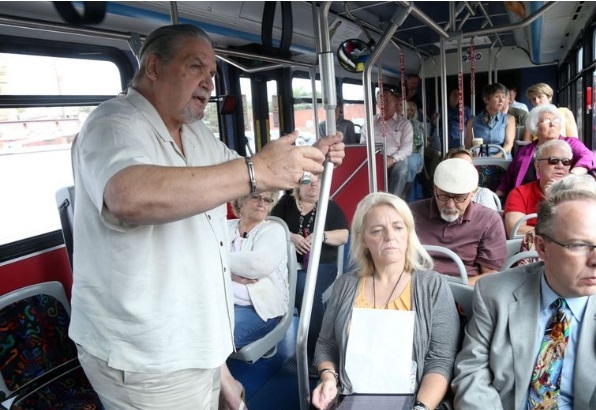 Private, nonprofit and public officials took the trip, which was on a Tulsa Transit bus. The purposes of the ride were to become familiar with Tulsa’s stretch of Route 66 and to brainstorm ideas for supporting preservation and commercial revitalization. Ken Busby, executive director of the Route 66 Alliance, said the city has a lot of potential for growth along the roadway. “I’m extremely optimistic Tulsa’s Route 66 will generate more sales tax revenue by attracting even more visitors from all over the country,” Busby said in a news release. Route 66 historian and author Michael Wallis, the trip’s tour guide, fell on the bus and apparently dislocated his right ring finger, America said. An EMSA ambulance then met the tour at the first stop — the Crystal City shopping center in west Tulsa — and put a splint on Wallis’ finger. What has Executive Director & CEO, Ken Busby been up to lately! ?